Category: May be a part of your Journaling practice, one of the three core daily practices. The average person has about 50,000 thoughts a day. Most of them are just like the ones you had the day before. Occasionally, though, you have a realization that is new, powerful, and potentially life changing. Perhaps it's an insight into how to make your relationship better, or maybe it's an ingenious idea for how to complete a project at work. Whatever your insight, it likely becomes lost as it's quickly overwhelmed by all the other thoughts in your head. Oh well. If you had only written it down, you could have reaped the rewards of your important realization. You don't have to let your bright ideas get lost anymore. By beginning an idea journal -- or by using your journal for sketching ideas -- you can keep track of your most meaningful thoughts. An idea journal is not like a diary in which you summarize important life events. Instead, it's a recording of your ideas, insights, and hopes. Like an artist's sketchbook, it's where you jot out a rough draft sketch of concepts you can subsequently flesh out. An idea journal becomes like a trusted friend, reminding you of where you want to go in life, and how you can best get there. By reading your idea journal periodically, you can trigger important new insights, as well as inspire yourself to take actions that can change your destiny. These five guidelines can help you turn a book of blank pages into one of your most prized possessions -- one that has a profound impact on your life. 1. Keep your idea journal near you at all times. You never know when brilliance will strike. For convenience, some people have a couple small journals, rather than one large one. Others find it handy to keep a mini digital recorder around to record important thoughts. (Then, when they have time, they transfer their recorded thoughts into a computer file or journal.) A third approach is to type ideas into a laptop computer, smartphone, or tablet. Whatever your means of recording, have it near you at all times. 2. Write (or record) in your journal the moment you think of something you don't want to forget. If you're in the shower or walking the dog when a great insight comes, immediately stop what you're doing and record your thoughts. I used to think I could write down my ideas at a later time, I almost always forgot to. I use a digital audio recorder because some of my best insights came while driving my car or walking my dog. Since my brain now realizes I take its insights seriously, my brain now produces more important realizations than I used to have. Keeping an idea journal is like taking care of a beautiful flower: the more you attend to the brilliant "flowers" in your mind, the more they grow. 3. Structure the entries in a way that works for you. 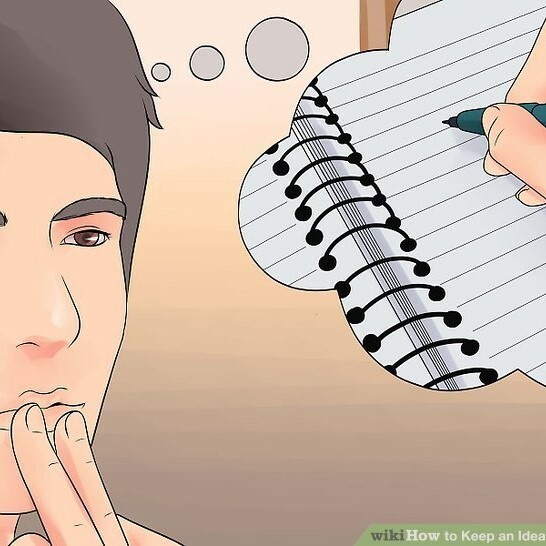 Some people derive the most benefit from an idea journal when the entries appear in outline form, while others prefer an unstructured way of writing. As you practice, you'll soon discover what works best for you. 4. Discern what to include and what not to include. If you write too much in your idea journal, it will be boring to read. If you write too little, using it for only the profoundest insights, it will not be as useful a tool as it could be. Again, with time and practice you'll find the best balance. Personally, most of my journal entries fit under four headings: important insights, personal goals, actions I'd like to take, and creative ideas. Coming up with your own list of categories will help you get a feel for what to include and what not to. 5. Discover your method for using the entries you've made. I set aside a small period of time each week to review the previous week's entries. As you look over your entries, I think you'll be pleasantly surprised to realize the quality of your insights. True genius is not something reserved for a chosen few, but rather is something we all experience on occasion. By keeping an idea journal that records your most profound thoughts, you'll be able to make greater use of the genius within you, and compassionately offer to the world a more creative you. See also: "Four Reasons to Keep an Idea Journal"
"How to Keep an Idea Journal"
"Keys to an Effective Idea Journal"